Happy Friday, my friends! 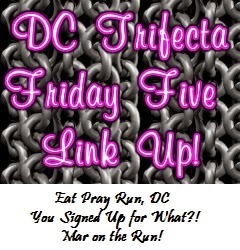 Per usual, I am linking up with the lovely ladies of DC: Courtney at Eat Pray Run DC, Cynthia at You Signed up for What?, and Mar at Mar on the Run, as I do every Friday. 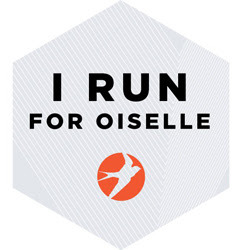 This week's theme is "Favorite Fuel for Running (or working out)". 1. ENERGYbits. Seriously, these tiny green/blue tablets are like magic. I have a nervous stomach and can't eat before races, so these have come in handy. They give me the energy I need to finish strong, and help keep the hunger pains away. I take my ENERGYbits about 15 minutes prior to my run, and depending on the length also during. 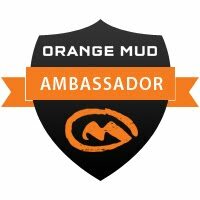 I became an ambassador about a month ago, so if you are looking to buy a bag, use code 'HeatherRuns' for a 25% discount on energybits.com. You can use it on any of their products – ENERGYbits, SKINNYbits, VITALITYbits, and RECOVERYbits. You can read my initial review here (written well before I became an ambassador), or my ambassador post here. 2. Clif Shot Bloks. I love these guys. I take a Shot Blok about every two miles (for longer runs, which to me is 6+ miles). This helps give me the calories my body needs to finish the longer runs. I had a lovely surprise recently as well: I'm a BibRave Pro and Clif was extremely generous in sending us some products to try, and I got a bunch of Shot Bloks in the orange flavor, which I've never tried before (I usually go with Tropical Punch, Black Cherry, and CranRazz). Yay! 3. Picky Bars. Booyah! I am a member of the Picky Club, and love love love these bars. They offer an array of flavors (my favorites are All-In Almond and Cookie Douhpness) and they pack a good amount of protein and carbohydrates – perfect for athletes. I like to eat one about 30–45 minutes before a run, or if I'm hiking, I'll take them with to eat during. 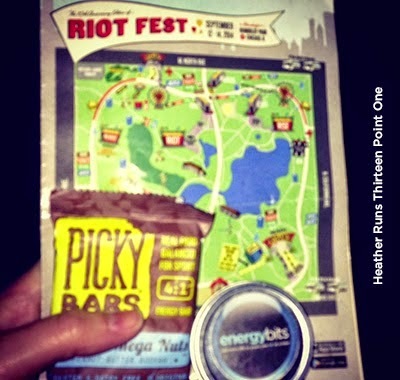 I also love them for just a general snack—my snack drawer at work is always stocked with them :) You may have noticed that both Picky Bars and ENERGYbits got me through the longs days of standing/running around at Riot Fest last month. Couldn't get a good photo, but you get the idea. 4. Pizza and Beer. Yes, I said it. The days where I've had pizza and a beer (craft, of course) before a long run, the long runs have gone surprisingly well. Maybe it's the carbs, or perhaps it's just comfort food that takes away my nerves, who knows—I'm not going to question it if it works ;)—but I've taken to loving it for dinner the nights before a run. It's not always pizza, one time it was loaded cheese fries and a delicious grilled cheese sandwich. The next day, 9.5 miles done without a problem. And let's be honest, these are foods and drinks I love, so it makes me so happy that I can eat them the night before a run and be ok haha. Here's the secret, though: It's about portion control and not over doing it. When I'm full, I stop eating (usually bringing half a sandwich home for the next day) and I have two beers tops. Then, once I'm home, I'll drink some Nuun before bed. 5. If I'm able to eat before running, I sometimes go with a bagel with peanut butter or an english muffin with butter (just a little). This will usually be consumed about an hour or two before the run. Obviously, if it's a morning race, I choose sleep over waking up early enough to try and eat something (mostly because I know I won't be able to eat regardless). What are some of your favorite fuels for when you are running/working out? I still need to try some Energy Bits; thanks for the reminder, Heather! I have a sample at home and I keep forgetting to get them out! I'm with you on the pizza and beer; hey, if it ain't broke... :) Hope you have a great weekend! I just bought my first Picky Bar, but haven't tried it yet. Can't wait. I think maybe it helps calm the nerves and helps me get some shut eye. I've wanted to try Energy Bits for a while, but you throw in a discount code and what reason do I have to say no?!?! Oh, and pizza and beer is definitely the meal of choice pre-race. I had pizza (and a beer) for dinner, next day, new half marathon PR! Haha, none! How could you resist? You deserve it! i have some picky bars coming my way and i can't wait to try them!